Alex is 13-year old who injured his right knee (distal femur growth plate) in a ski accident at age 11. He developed leg length inequality and a flexion deformity of his knee as a result of abnormal growth just above the knee. The current LLD was 2.5cm but was predicted to be 5.5cm at maturity (when he stops growing). His inability to straighten his knee was also expected to worsen. 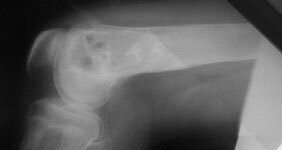 We performed a femoral osteotomy to lengthen and straighten his femur. Then lengthening progressed a 1mm per day and a lot of therapy was needed to maintain his mobility. We used an EBI monolateral lengthening frame. 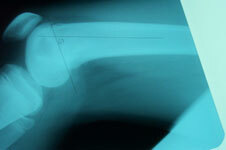 We acheived a 5.5cm (2 and 1/2 inches) lengthening and at 5 and 1/2 months, the new bone was mature and strong. He is doing well and can straighten his right knee completely. His right leg, which was previously the shorter leg, is a bit longer until the left leg catches up.